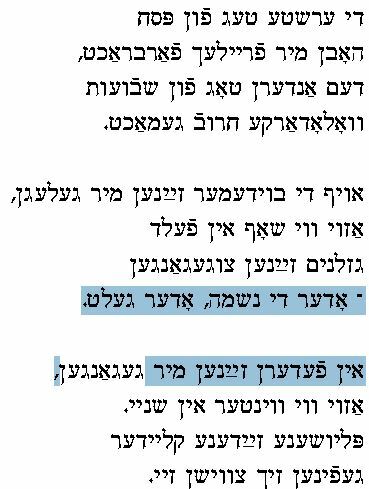 Lifshe Schaechter-Widman (LSW) sang this version of a song about the pogrom which was adapted for other pogroms, or perhaps was itself already an adaptation of an earlier pogrom song. 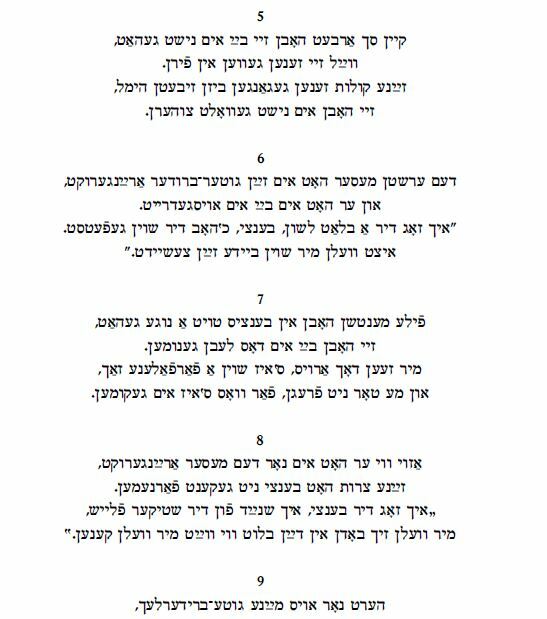 In this post we note two other pogroms with versions of the song. The third pogrom where this song was used was in Volodarka, Ukraine. 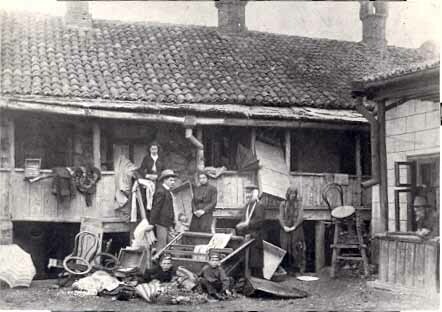 This pogrom took place in July 1919 amidst the Russian Civil War. 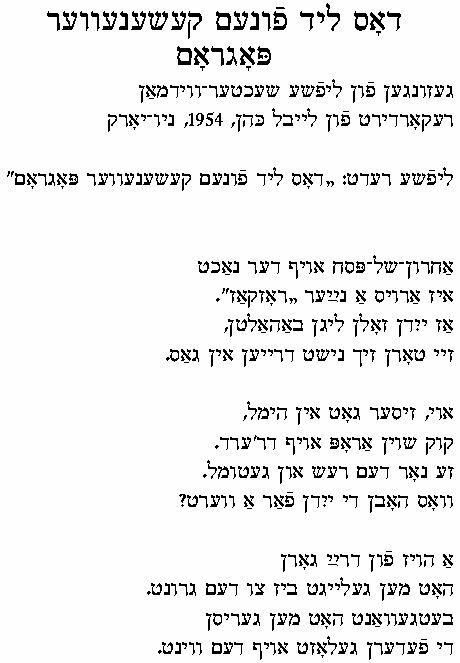 The lyrics (as collected by S. Kupershmid) appears in the Tsaytshrift far yidisher geshikhte, demografye un ekonomik literatur-forshung, shprakh-visnshaft un etnografye 2-3 (Minsk, 1928) page 803. It too contains the lines of walking through feathers as through snow in winter, and this emerged as one of the primary pogrom images, as we see in our Kishinev pogrom examples and others. 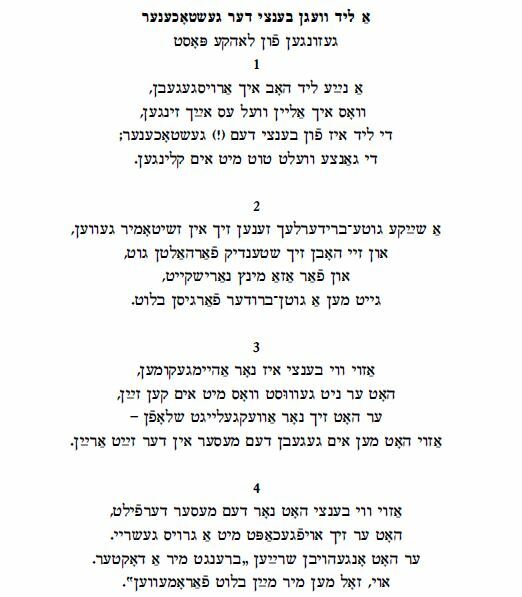 On the Workmen Circle’s LP “Amol iz geven a mayse”, Sidor Belarsky sings two verses of an abbreviated version of The Kishiniev Pogrom song. The song begins at this link – double click on “Amol iz geven a mayse (cont. )” and go to 12:30 minutes. Az yidn zoln lign bahaltn. Zey torn zikh nisht dreyen in gas. kuk shoyn arop af dr’erd. Ze nor dem rash un getuml. Vos hobn di yidn far a vert? hot men geleygt biz tsu dem grint. di federn gelozt of dem vint. azoy vi vinter in shney. 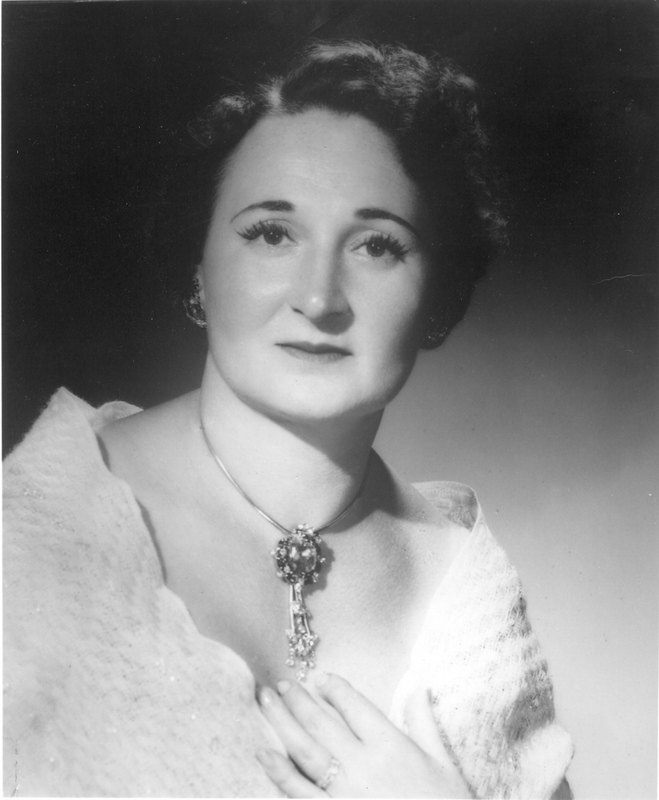 Di mener tserisn of tsvey. Vus zey hobn gur keyn vert? a new regulation was issued. they aren’t allowed in the street. Look already down on the earth. See the tumult and chaos. Are the Jews worth anything? was destroyed down to the ground. the feathers blew in the wind. as in winter in snow. Look already down to the Earth. that they are of no worth. Ven ikh volt gehot dem keysers oytsres (If I were to have the Emperor’s Treasures) was written by Mikhl Gordon (1823 – 1890). 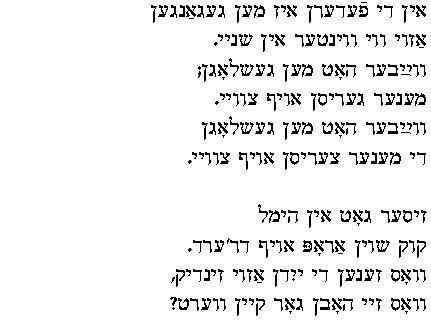 According to Chana and Joseph Mlotek in their Yiddish-language work Perl fun der yidisher poezye, 1974 (now available in English), this song was originally called “Shlof mayn kind” and included in his first collection printed in 1868. 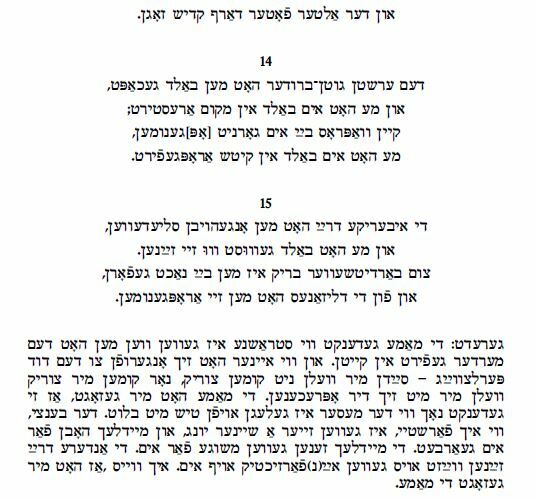 I have not seen Gordon’s work so I am not sure how many verses are in his original but a third verse is included in some recordings and collections such as Z. Kisselgof’s Lider-zamlbuch, Berlin 1914, that concern the father going to hell. 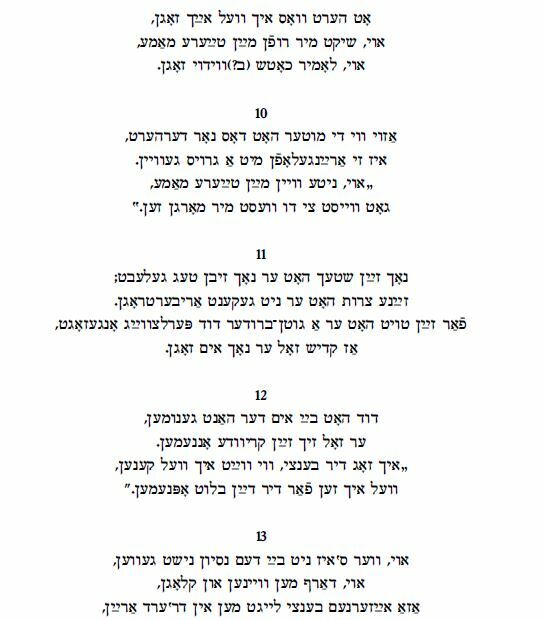 That verse adds a little bittersweet humor to the song, and it’s interesting that with a woman singer such as Ita Taub the verse is dropped. As Taub sings it, the song only relates directly to the mother and child relationship. vi di bist bay mir nikhe. as you are pleasing to me. az di gontse velt iz mayn. That the whole world is mine. zolst nor leybn un zayn zezint. Sleep may child, sleep my child. will stand open for me. vet zayn a frimer un a giter.